Where are water-from-air machines an appropriate and effective niche technology for augmenting drinking water supplies? 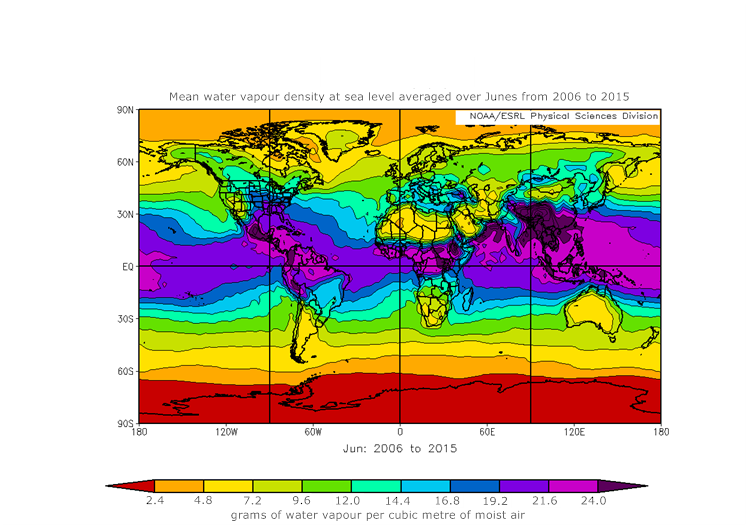 I've produced monthly water vapour density maps to provide a quick guide. Locations within the latitude band 30° N to 30° S are usually good unless they are at high altitudes (more than a few hundred metres above sea level). Outside of this band, machines are likely to perform satisfactorily during the local summer (high sun) season. Locations with less than 9.6 grams of water vapour per cubic metre of moist air (see legend below the map) are unlikely to be good locations for water-from-air production—the energy cost of producing a litre of liquid water is going to be unacceptable to most users. Monthly water-from-air resource charts are available for planning the deployment of atmospheric water generators (AWGs). A full set of monthly maps is available in the Water-from-Air Quick Guide. Mean water vapour density at sea level averaged over Junes from 2006 to 2015. This image is an original interpretation by Roland Wahlgren of water vapour density after a base image (specific humidity) provided by Physical Sciences Division, Earth System Research Laboratory, NOAA, Boulder, Colorado, from their web site at http://esrl.noaa.gov/psd/. NCEP BAMS article reference for the NCEP Reanalysis data: Kalnay, E. and Coauthors, 1996: The NCEP/NCAR Reanalysis 40-year Project. Bull. Amer. Meteor. Soc., 77, 437-471.This image with water vapour density units is copyrighted by Roland V. Wahlgren, Atmoswater Research. Click image to enlarge. 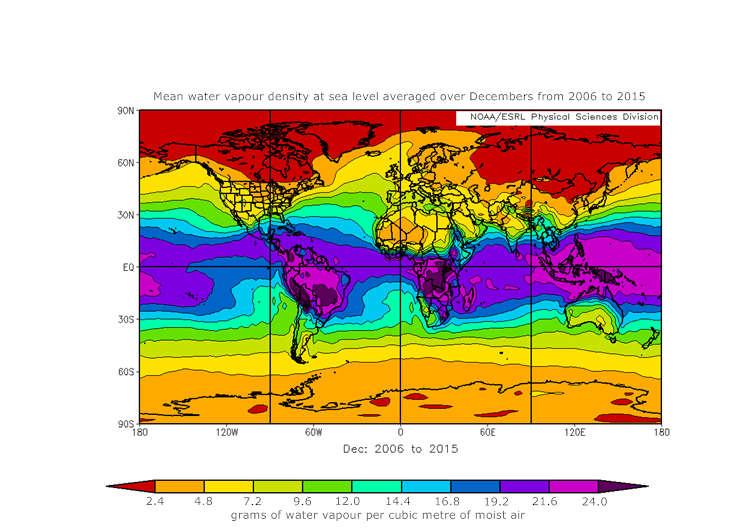 Mean water vapour density at sea level averaged over Decembers from 2006 to 2015. This image is an original interpretation by Roland Wahlgren of water vapour density after a base image (specific humidity) provided by Physical Sciences Division, Earth System Research Laboratory, NOAA, Boulder, Colorado, from their web site at http://esrl.noaa.gov/psd/. NCEP BAMS article reference for the NCEP Reanalysis data: Kalnay, E. and Coauthors, 1996: The NCEP/NCAR Reanalysis 40-year Project. Bull. Amer. Meteor. Soc., 77, 437-471.This image with water vapour density units is copyrighted by Roland V. Wahlgren, Atmoswater Research. Click image to enlarge.